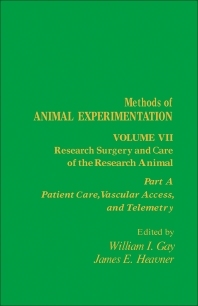 Methods of Animal Experimentation, Volume VII: Research Surgery and Care of the Research Animal, Part A is a collection of papers that deals with methods used in animal experiments involving patient care, vascular access, and telemetry. This book concerns technologies in experimental surgery — complicated procedures requiring longer observation time of the test animal, and an increase in the spectrum of animals that can be used. One paper describes the anesthesia, analgesia, and kinds of restraints that are suited for the test animal. A wide array of choices of inhalational agents, injectable, local anesthesia (lidocaine), analgesics (opioids and aspirin), and restraint (nonanesthesia and neuromuscular-blocking agents) is available for the researcher to choose from. Several authors also describe the use of telemetry devices that are implantable in test animals to achieve minimal interference from the investigator. These devices include sensors such as flow transducers and probes to use in pulse or continuous wave-applications; electromagnetic flowmeters for blood monitoring; and integrated circuits for various applications. One paper discusses postoperative care including a patient care checklist, treatment of common postoperative complications, as well as venous catheters for fluid administration. This text will be appreciated by veterinarians, technicians dealing with laboratory animals, and researchers designing animal and medical experiments.